Actually, I didn’t do too badly in Las Vegas. I have a fairly low tolerance for feeding my hard earned cash to the one-armed bandit, and I’m fairly good at sticking to my vacation budget which includes a line item for how much I am willing to lose. You don’t go to Vegas and expect to win. Well… maybe there are some out there who do, but I’m not playing with the high rollers. 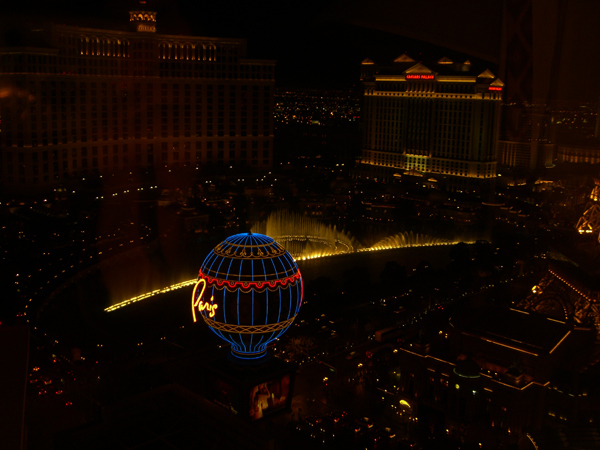 The pic is the view from my window at the Aladdin. Not bad, eh? What this picture doesn’t show is the daylight view. Everything from the Bellagio down to the Monte Carlo is now a big hole in the ground, soon to be filled by a high-rise casino/shopping/condo/timeshare thingy. Every time I got off the elevator, some joe tried to sell me a timeshare. Or, if I wanted, they’d be happy to sell me the whole condo. Sure… I have a few spare millions just lying around. On Thursday morning, sick and in need of coffee, I told one sorry, I’d rather knit. He looked rather startled, and I have to admit it makes no sense to me either. But afterwards, that particular salesman backed away whenever I entered the casino by his assigned station. I took that picture the first night after I had checked into my room and settled in. Not much sleep came my way that night, and I finally got up at around 5:00 AM with a splitting headache and a pouring nose. Yep. The cold that I had been holding at bay for days and days finally got me. With no energy and flagging spirit, I never made it outside the casino. Ah well. Them’s the breaks. The Aladdin is undergoing renovation on its way to becoming a Hard Rock Hotel. Part of the casino is walled off while the renovations proceed and a lot of the games have been moved up to the mezzanine level. The better restaurants are closed, also. A few new ones have opened off the mall, but I didn’t try them out. I found that the mezzanine is very quiet because hardly anyone plays up there, and the slots looser than on the main floor. I found a slot machine that payed enough that I could play for a long, long time on $20. I will have Walk Like An Egyptian going through my head for days now, but the quiet and repetitive button-pushing suited my cold-addled brain quite well. The casino nicely comped me some free slot play, and I almost won enough back to break even. Not quite, but close. I consider that a successful casino visit. The Aladdin has one of the better casino malls, in my opinion. So, a little shopping was done. OK… a lot of shopping, but very little buying. So now I am home and feeling a little better. I slept last night in my own bed with my own cats piled around me, and life was good. 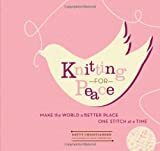 For Christmas, #1 Son gave me Knitting For Peace, a wonderful book full of simple patterns that can be made with inexpensive yarn, and lots of stories and ideas about knitting for others. He gave me the book a couple of days early, and we leafed through it together, looking at the pictures. When we cam to the picture of the Caps For Kids Swirled Ski Hat, #1 Son said Mom, if you knit that for me I would so wear it. Blue would be nice. What more does a mother need to hear? It’s not often that #1 Son asks me to knit him anything. When he does, I believe in striking while the iron is hot (so to speak). Yarn was purchased that very day and the hat was cast on that very night. #1 Son had already received his big present from me, but I was determined that Santa would leave a hat under the tree for him. I couldn’t hold him still long enough to take a picture of the hat actually on his head, but rest assured that it fits perfectly and he liked it. Yarn: Karabella Aurora 8 (100% extrafine Marino wool/ 50g, 98m per skein) in colorways #1 (dark blue) and #44 (light blue) — about 1-1/2 skeins of the light and 1 skein of the dark. 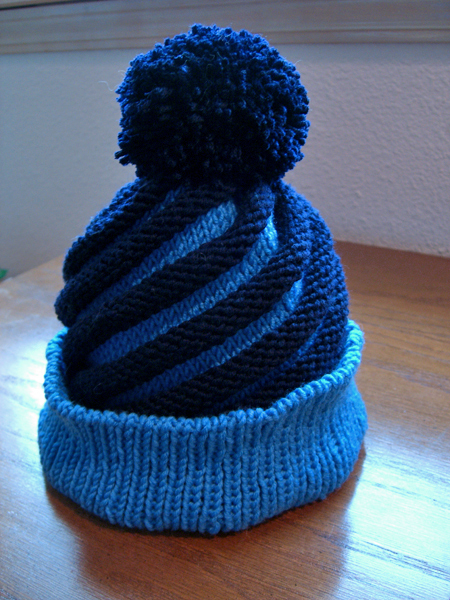 A second skein of the dark blue was needed to make the pompom after I totally messed up the first pompom, but those better at making pompoms than I could make one using the leftovers from the second light blue skein. 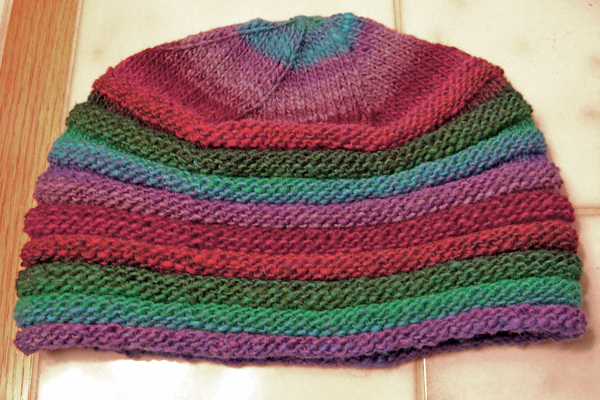 For adult size large, cast on 50 stitches and worked one extra pattern repeat. Blogging may be sparse or non-existent for the next few days. Not that there’s been an overwhelming amount the last couple of weeks. You know how the holidays are. What every holiday, event, anniversary you celebrate — or even if you celebrate none at all — I hope yours is happy and full of love and joy and that your loved ones are all around you. P.S. Go to Google and click on their logo. You know how they often have seasonal themes? By clicking on the logo you can see all of the days in the series. Yesterday the little kangaroos were knitting! 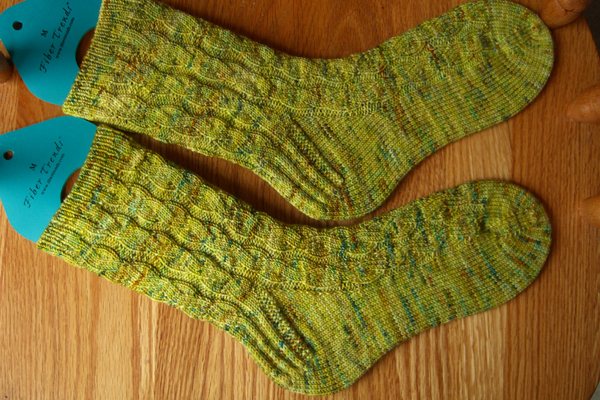 The Snake River socks are progressing up the ankles. No, I have no pictures. Yes, it’s still raining. No, there is no light. 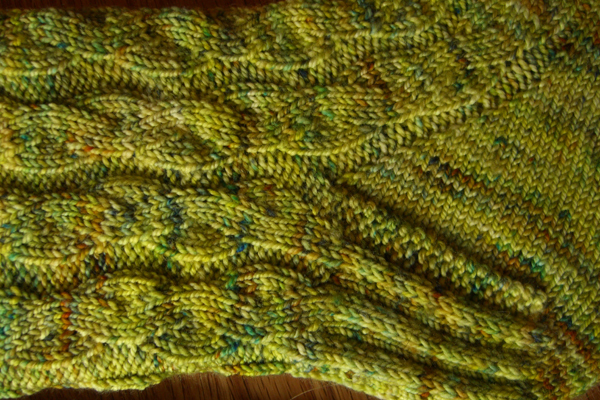 It might stop raining briefly this weekend, at which time I will madly snap all kinds of pictures of anything I have knit lately. Yes, I would like some cheese with that whine. I just found out that I need to provide a $10 – $15 gift for a gift exchange. I’m thinking that knitting a quick hat (need to have it by Monday) would be much preferable to venturing out into the malls and shopping centers of America amidst crazed shoppers looking for that perfect bargain with only 10 shopping days left before the immovable Christmas deadline. If I use something stripy like Noro it will look a lot harder and more expensive than it was. What do you think, gentle reader? Can this knitter, to whom deadlines have not been kind lately, actually produce something on time? Since I still have no real knitting content here, I will offer this picture of my lovely and wonderful niece Z at her school’s Christmas program. (She attends a private school so they can still call it a “Christmas Program.”) The kids were all super cute and the program was fun. I’ve sort of missed this kind of thing a bit since #1 Son has grown up and stopped doing school programs.